As part of the blog tour for Claudia Mills and her latest contemporary MG Zero Tolerance (which I loved, as you can see from my review), I'm incredibly honoured to be able to interview Ms. Mills herself on Zero Tolerance. And once you've finished reading the interview, don't forget to enter the giveaway to win one copy of Zero Tolerance yourself! Find Zero Tolerance on Goodreads or Amazon. 1. First, I have to ask: is any part of Zero Tolerance based on real life? First, I have to say, thanks for hosting me on Pass the Chiclets today! Sierra’s threatened expulsion from school for an innocent mistake was based on an actual incident that took place a few years ago in a middle school near my home in Boulder, Colorado, when an honor student faced serious sanctions for bringing a knife to school in the wrong lunch. I don’t even remember how that story played itself out; I just remember thinking how much the student in question would have to rethink so many of her fundamental assumptions about how her world worked. 2. Sierra has a group of girlfriends who often share pagetime in their interactions with Sierra. How did you ensure each of her friends had a distinct personality? Amazing! It's always interesting to learn about the writing process, and it's very intriguing that your scenes are almost cinematic for you. 3. I adored the budding romance between Sierra and Luke. What was your favourite scene of theirs to write? “Good girls” are always attracted to “bad boys,” aren’t they? I think my favorite scene was in Chapter 14, when Luke opens up to Sierra for the first time, as he tells her about “Backwards Day” in kindergarten and about his parents’ quarrels over how to respond to his alleged attention deficit disorder. I always love the moment when characters first make a genuine connection. Haha, I suppose they are. And yes, I loved that moment too, so much that I actually quoted it in my review! 4. Sierra's mother and father have a very push-and-pull dynamic. Was this challenging to write from Sierra's perspective? I grew up in a much happier family than Sierra’s in many ways, but I still remember vividly the few moments of conflict my parents had: those memories are seared into my heart. And I know my own two boys had to listen to occasional moments of parental argumentation that they would rather forget. So I tried to tap into the universal awfulness of being a child witnessing parental discord, while being so powerless to intervene in the situation. 5. Are there any outtakes which you really loved and were particularly sad to cut? Yes! Initially I had Sierra write not one but two letters from the school secretary’s computer. The second letter was a love letter from Ms. Lin to the principal, Mr. Besser. I adored the scenes when Mr. Besser is now trying to avoid Ms. Lin and finally has a confrontation with her about it. Delicious! But both my writing group and my editor thought two letters was one letter too many, so that one had to go. Wah!!! Oh my gosh, that sounds hilarious and so fun! I so wish we had been able to read that scandalous letter. 6. 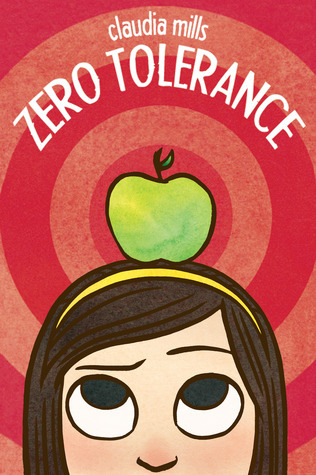 What's the one scene or aspect of Zero Tolerance you hope readers will remember? It’s the scene in the hallway during the expulsion hearing, when Sierra has to decide how she wants to respond to her father’s carefully laid plans to destroy the principal. So much is at stake for her in that scene. What happens during those few minutes in the hall allows Sierra to define her own identity and decide what kind of person she wants to be. Oh yes, that scene resonated with me, and I could understand how Sierra's journey was coming to a defining moment. It's great to hear how important to you it is. Thank you for the wonderful questions, Eden, and for giving me this chance to share my book with your readers. Thank you so much to Ms. Mills for this interview! And now... you want to win a copy of Zero Tolerance, right? You know you do. So go ahead and enter! This giveaway is open to Canadian/US residents and ends September 24, 2013.